Complete, sign and return the application and consent statement. Receive your You First membership card and Provider Report in the mail and call your doctor or nurse to make an appointment, or call our member services coordinator if you need help finding a doctor. Call 800-508-2222 if you need help with transportation or interpretation services for your You First appointment. 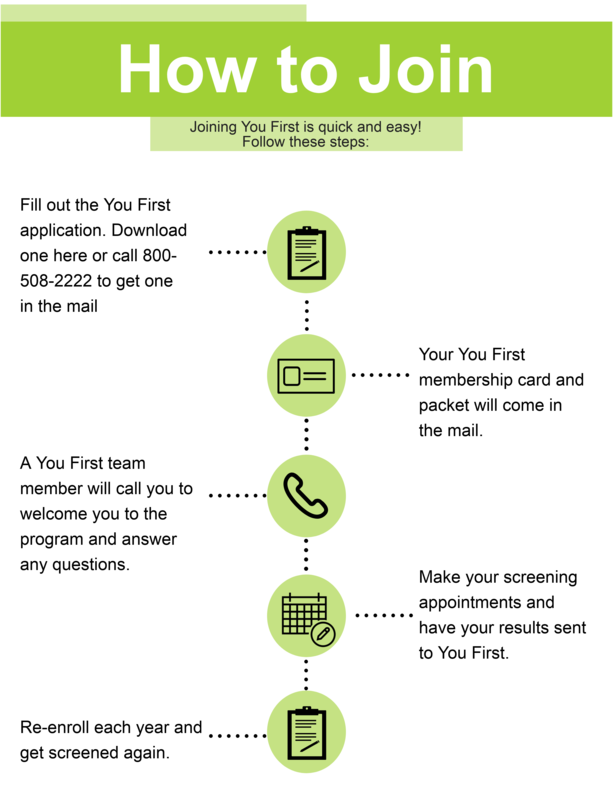 Bring your You First membership card and Provider Report to your You First health screening visit. Receive your test results and work with your doctor, nurse, or the You First lifestyle program coordinator to set health related goals and get connected to resources and programs to support your health. Re-enroll each year and get screened again.